Poblano peppers, or chiles, are rarely used in their raw form. While some ingredients are ready to jump in your mouth or in the pot, like an apple or a carrot, others have to go through a couple steps to bring out their finest qualities in flavor, color and texture. But those extra steps are so worth it! It can seem hard at first, but once you prepare them a couple of times the process becomes very simple. Plus you can make more than you need and freeze them for up to 4 or 5 months. Here are the steps. To do so, you can either place them on a tray under the broiler, directly on the grill or directly on the open flame, which is what is typically done in Mexico. I prefer to broil them because you can do many more at one time, and it just seems faster and easier. Whatever method you choose, turn them every 2 to 3 minutes for a total of 6 to 9 minutes. They must seem charred and blistered on the outside, but the flesh must be cooked though not burnt. Just like roasting marshmallows over a fire. Once charred and hot place them in a plastic bag, close it tightly and let them sweat for 10 to 20 minutes. Preferably under a thin stream of cold water, remove the charred skin which should come right off. Make a slit down one side of the pepper and remove the cluster of seeds and veins. If being used to stuff, keep them whole with the stem. If being used for rajas, take the stem off and make slices. I like them of about 1/2-inch wide. If you want your poblanos to be fairly mild, once prepared, let them soak in warm water mixed with a tablespoon of brown sugar for 10 to 30 minutes, then drain. Pati, I always peel my poblanos after charring and sweating, but why do they need to be peeled? Oh it’s because of the texture, Felicia. I have noticed that the older Poblanos have a tougher skin that would need this process. The younger, smaller Poblanos are soft enough to use in a recipe where they will roast in the oven, such as pizza. Where on the Pablano do you make the slit and how do I get out the seeds if preparing to stuff? I have tried and they fall apart with all the stuffing falling out. You make the slit on one side of the chile (top to bottom). Then you can use a spoon or knife to scoop out the seeds and veins. Pati how do you store your peppers such as the jalapeno or poblano peppers. I keep them in the refrigerator, or if I will use them within a day or two, I keep them on the counter in a cool dark area. Im making a poblano nacho stuffed with chicken and cheese and a crispy corn tortilla.. Would you give me advice on how to have my pepper taste just right without it being too spicy and soggy? Thank u..
Hi Pati. Thanks for this post. I learned how to char and use chilies watching your program, but I’m no expert. Pinning it and looking forward to reading all of the comments and replys. Love the flavor of poblanos! Thank you for this post. I received poblanos as part of my CSA (community supported agriculture) and I had no idea how to prepare them. I tend to steer away from cooking chilis since I don’t like too much heat in my foods.Your tip about soaking them in brown sugar and water was just what I needed to keep the flavor mild. I quite like the taste now. I read your article on roasting poblano chiles and need your advice. I’m trying to come up with a recipe for baked chile rellenos with the batter coating. I think I have the batter figured out using a masa recipe for pancakes. Any better suggestion for the batter? 2nd, does it make a big difference if the chilrs are roasted 1st? If yes, does it hurt to leave the charrred skin on? Wow, anti-spellcheck was in full gear! To paraphrase: the plants grew huge, they were loaded with fruits, but the fruit never ripened past the shiny green stage. I have been using the dried ripe is poblanos – anchos – from the grocery to make powder so I grew two plants this season. The plants grew ignore this, they were loaded fruit, but none of them right and passed shiny green. So I tried some of them in the flavor was far too green peppery for me. Are grocery store ancho chiles or ancho powder made from drying green or red poblanos? I have very few that have made it to red, and would to dry the green ones, but don’t know if it will create the same thing as what you buy in the store. Thanks! Ancho chiles are poblanos that have been dried. All the poblanos are red/dark chocolate color. So to grind them, you have to dry the green poblanos, or buy the already dried anchos. Is it just me or are fresh Poblanos not really used for many recipes? Every recipe I’ve looked at that “sounds interesting” calls for dried/reconstituted Anchos, which I’ve read are fully-ripened (red) poblanos that have been dried. Can poblanos be dried….. Is that what a chipotle is? If I dry them then how do I prepare them later on for use. Thank you so much for the opportunity to ask a question on line! Googled “roasting poblanos” today. Glad I picked this answer! Tossed them on the grill, steamed, peeled and froze 🙂 So easy…which is nice because we’ve got a ton more on the vine 🙂 Thx so much. Can poblanos be canned for future use in chiles rellano? If so, how? Thanks. Can you send me a good authentic cjile renos recipe? My son even though cajun–loves mexican food. Any help would be appreciated. Love the show!! Hi Michele, The seeds in poblanos don’t add to the flavor (or have a nice flavor), like they do in jalapenos and serranos. My advice is to remove as many of the seeds as you can; if there are a few left in there, it’s ok. I slice Poblano’s and simmer in Chili. I do not prepare the chili’s in anyway prior. I like the flavor added just from simmering. However, I was wondering if you think I should grill, sweat and/or peel them before simmering? Hola Scott, Thanks for your message! You’re free to prepare them however you enjoy them most. However, if you do try charring, sweating & peeling them, no need to simmer. I have a cayenne and tabasco pepper plants. They have lots of peppers on I would to make hot sauce like “red hot” brand. I am guessing I leave pepppers on till they turn red?? Please share thoughts, ideas and a recipe. Thanks in advance for your response. Hola Donna, Thank you so much for watching the show! Yes, harvest the peppers when they are red. I like to just BBQ my vegetables during the summer months. I prefer to roast them on the BBQ and then stuff them with other vegetables and cheese. I do this frequently with zucchini and would like to also do this with peppers (poblano/pasillo specifically). Do I need to roast and peel them first? This seems like cooking them twice to me. After seeding the peppers (just a slit down the top) can I not just put them on the BBQ along with the zucchini for 30 minutes, turn them over, add the stuffing and cook until the stuffing is good and hot? All over indirect heat. I forgot, on using a chore boy, don’t scrub, just pull in down towards the tip of the chili. Very fast and little mess when down over the sink with running water! A great way to rub off the blistered skin is use a dedicated copper chore boy scrubber. You can lightly rub and fast get the skin off. Give it a good blast of water to be sure there aren’t any bits of copper…it sometimes breaks off, but it is so bright you can see it and wash it away. If you’ve a camp stove that runs on the little propane tanks, take it outside and use it roast your peppers on an open flame. Fun and yummy! Great to know, Pam!! Thank you for sharing! I had a bumper crop of poblanos last summer, and then a family emergency required I leave immeditaely. I popped the peppers into freezer bags and stuck them in the fridge. There they sit. Any recommendations for working with frozen but unprocessed peppers? Hola Liz, Thank you for writing to me. 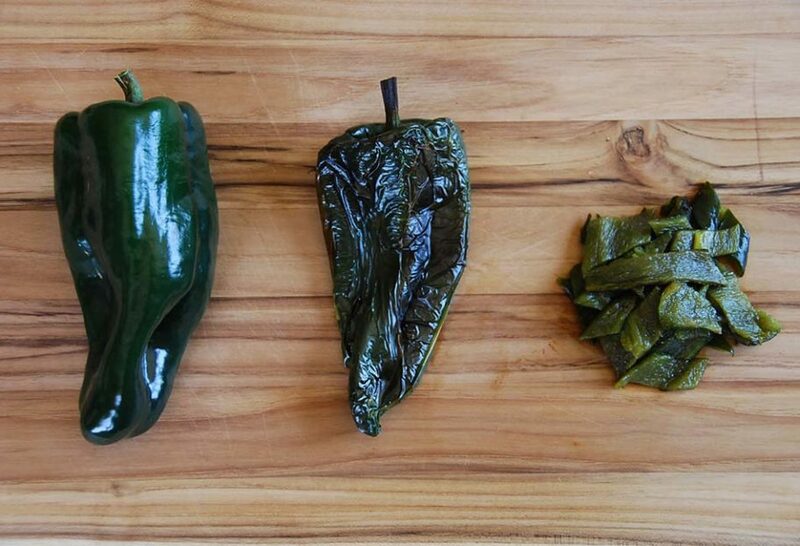 You may try thawing the poblanos completely, then gently pat dry to remove as much moisture as possible, and then roast, sweat & remove skin as usual. I’ve been preparing these wrong, for quite some time. I like the poblanos sliced in half, seeds removed, then I rub oil all over the pepper and stuffed with mozzarella cheese. Then I bake the peppers at 450 for 20 minutes. I don’t remove the skin, just eat them as is. Is the skin, after baking, bad for me? No, it is not bad for you at all. I love that you answer questions here on your blog! I have a bumper crop of tiburon and serrano peppers in my garden right now. My question: what kind of cheese do you recommend for Chiles Rellenos? Every recipe I find and each restaurant I visit seems to use a different cheese. I live in in St. Louis, Missouri, where there’s a big “little Mexico” (Cherokee Street) with dozens of groceries and restaurants, so I hope I can find some authentic cheese or a good substitute. Anything that melts and has a good flavor but not to overpowering goes. My favorites are Oaxaca, Mexican Manchego, Asadero. But if you don´t find those, you can use Mozzarella or Monterey Jack for example. Muenster works well too! What is the best way to cut or slit the poblano peppers when preparing them for chili rellenos? i’ve seen them cut at the top, on the side, what do you recommend? My son and I love you and your show. We are planning on planting a backyard full of peppers this spring with Poblanos as the star of the garden. We look forward to many tasty dishes based on your recipes. Thank you for teaching us the proper way to cook really tasty food that we can grow ourselves. Thanks! I’m replacing jalapeno peppers with poblanos for a milder taste on a dish (for my 4 & 7 years old), We tried your chilorio burritas and they were a hit! I have you now under “My Favorites” tab, I can’t wait to try other recipes! Can the poblano be frozen whole or does it have to be sliced? Can the prepared poblanos be frozen for later use? Pin Amos beat Americano Green Peppers any day. Poblanos are easy to grow. It’s not hard to make them sweat! It’s just like your boss–make her sweat! Char them–peel them, sprinkle them with lime and use them. So…you make your boss sweat? ?..” Lol….. Thank you very much for these instructions. We have been trying to figure out how to get the thin skin off the peppers for a while now. Can’t wait to try this.